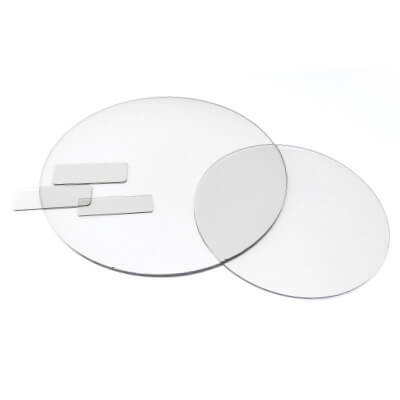 II-VI has developed processes to deliver wafers of polycrystalline CVD diamond at diameters of up to 145mm with exceptional thermal properties. With the ability to target a range of thermal conductivities from 1,500 W/mK to more than 2,200 W/mK, II-VI Advanced Materials can meet the needs in the most demanding thermal applications. II-VI has been running production-level diamond growth processes for a world-wide customer base since 2010. We have established high repeatability and reliability in producing diamond materials at even the toughest specifications. We are prepared to handle high volume production requirements for thermal management applications. Coupling our thermal management growth process with a world-class optical fabrication facility, II-VI can deliver laser machined, optically polished thermal materials to meet strict bow, warp, and surface roughness specifications to ensure optimal thermal contact to your high powered device. In addition to growth and fabrication, our staff are ready to work with customers through the use of internal metrology such as lamp flash thermal diffusivity measurements and SEM as well as thermal models to engineer application specific solutions. Our flagship T-2200 Diamond Thermal Management Material couples extraordinary thermal conductivity of better than 2,200 W/mK with high transparency in a wide range of wavelengths (e.g. 1um, 10.6um, IR, Microwave) making it ideal for high power optoelectronic applications. In addition state of the art, high performance optical coatings can be applied to further improve diamond’s already superb optical properties. The T-1500 Diamond Thermal Management Material, with thermal conductivity of better than 1,500 W/mK is an outstanding thermal management solution for a wide array of applications. This high performance material may be used in more price sensitive applications with the same optical finishes from our world-class optical fabrication facility. *This represents standard production. Product data sheets and specifications are available upon request.